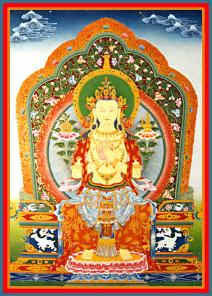 Maitreya is a bodhisattva revered by Buddhists of most schools. His name derives from the Sanskrit word maitri meaning caring or "loving-kindness" (in Pali, metta.) He is one of the few deities depicted in paryanka asana -- seated with legs hanging, like a Westerner. He is currently believed to be functioning in the Tushita heaven, and will be born on earth for the benefit of beings 4, 000 years [or 5, 000, according to another source] after the passing of Shakyamuni Buddha. of the Symbols [the outward forms] and the disappearance of the Relics ... .
Then when the Dharma of the Perfect Buddha is 5,000 years old, the relics, not receiving reverence and honor, will go to places where they can be received ... . Various groups, including authorities of belief systems other than Buddhism, calculate the date according to their own agendas. Asanga's devotion to Maitreya, Two Views and a Dog. The Maitreya Project initiated by the FPMT under Ven. Zopa Rinpoche is designed to benefit beings for at least 1,000 years to come. Bodhisattva Maitreya (Chin: Mileh-fo, Jap: Miroku Butsu or Bosatsu) is often depicted as a fat, laughing monk whose belly some considered auspicious to rub. He is also referred to as The Monk with the Cloth Bag. However, that image is based upon Chang Dingzi (907-1060) a Buddhist monk who was a native of Chekiang Province. He was an itinerant who wandered about at the end of the Tang and beginning of the Wu-Tai Dynasties propagating the Dharma. Though dressed only in thin monk's robes, he could lie on the snow without getting cold and wet, and he also had the ability of foreseeing the future. One story says that he had an eye on his back; perhaps he saw the past, too. Besides being a yogi, he was also a learned man, but everyone addressed him as Pu Tai -- 'calico bag' or 'cloth bag' after the large bundle that he carried wherever he went. He soon became worshipped as an incarnation of Maitreya. It is possible that the fat belly is symbolic shorthand for the Chinese idiom that is used to express someone who is exceedingly tolerant -- has a "big stomach." The monk may really have been fat, or since Maitreya is a bodhisattva with limitless compassion, the quality of character that is shown by an actual "big stomach" is further emphasized by the laughing expression and a version that has numerous, little children (noisy, too, no doubt) swarming over him. As Laughing Buddha, he is called in one Chinese transliteration, "Ta-pao Mi-Lei-Fwo." The fat belly and the children later led women to rub the belly of images of Mileh Fo a.k.a. Pu Tai, in hopes of conceiving children through his influence. The bodhisattva Maitreya is not to be confused with the American, Ron Spencer, who claims to be a messiah.